Illuminated by the eternal glow of the copper sun embedded in the ceiling of the dome, foul things have taken root. The glade seems healthy and abundant, although the orange lighting makes everything look a little brassy. The trees are healthy, the grass lush, and birds sing – a distinct difference from most underground lairs. But the only healthy thing under the copper sun is the water that flows through the dome. The large juicy fruit that always seem to be ripe upon the branches of the trees are strongly poisonous and the sap of the trees is a powerful acid. Even the grass, when disturbed, weeps a caustic green fluid that eats through leather and causes gangrene and neuropathy in creatures that come in contact with it. The birds are mechanisms hatched from the copper sun itself – little copper spies that track the comings and goings of those who visit this serene little hell. 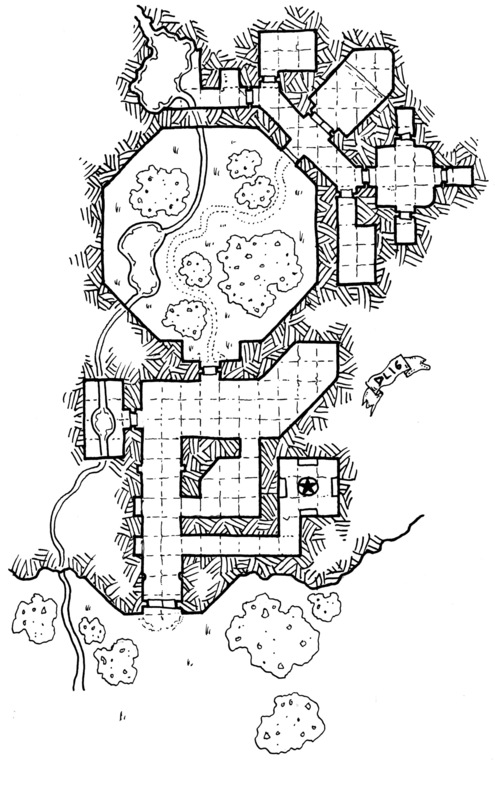 Ubrath of the Copper Sun, the wizard who helped build this structure around the strange artifact that it is named after, can still be found sitting under a tree by the small pond. He has been dead for decades but the copper sun has created a new spine for him that props him up and occasionally has him stand and speak to tell others that he is fine and that they must leave and respect his privacy and studies. It turns out that the copper sun’s mechanisms are quite effective, and Ubrath’s corpse still wields much of the magical might he had in life. As a teen I ran a campaign centred around a set of dungeons where each contained one or more octagonal chamber and at least one was a greenhouse of sorts inspired by the Tree of Life room beneath the map of Mars in the Ringworld. Some had many such chambers, another had but a tiny one more reminiscent of the fountain gardens found within the richest estates of Arrakis. If you like this map and would like to get a collection of my maps in one place, the 2014 Cartographic Review is now available which pairs up perfectly with the 2015 Cartographic Review, each with over 80 pages of maps and commentary curated from the collection posted to the blog. Inspired by Star Trek: TOS “Which Way To Eden?” if I’m not mistaken. I’ll be honest, the thought never even crossed my mind.